Snacks are thoroughly loved in Indonesia. It is a very usual view to have street food vendors doing rounds on housing screaming their products, and a few minutes later bunch of people will come from their houses and start queuing for the snacks. This usually happens in the afternoon, when it's past lunch hour and the dinner time is still far away. 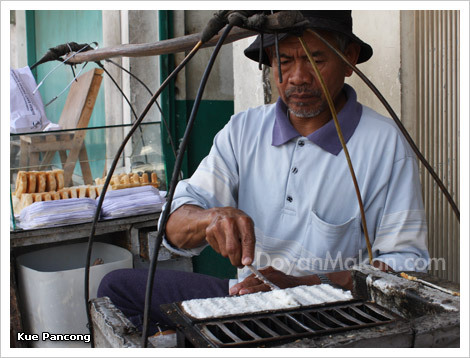 So here's for the second Indonesian Culinary Gems post; let me introduce you to one of Indonesia's popular snack: kue pancong or pancong cake or coconut cakelets. 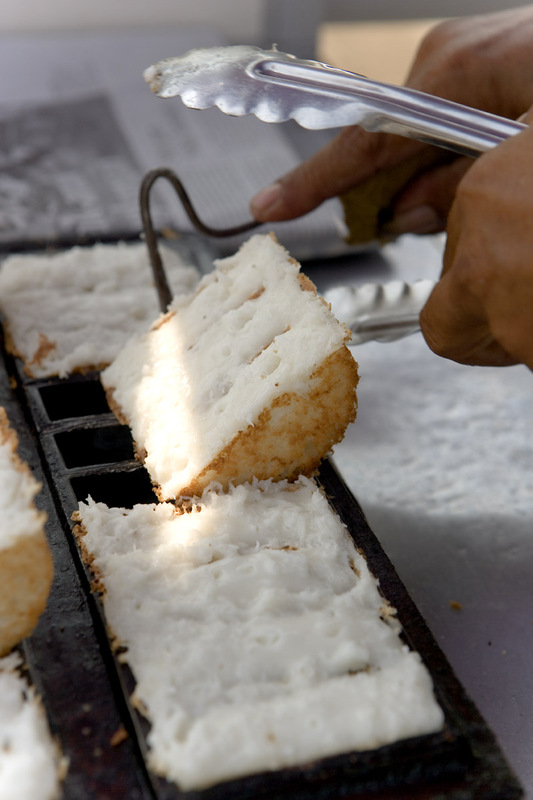 It's half-circle shaped snack, made from coconut, rice flour, coconut milk, and salt. The making involves a specific pan which has the same half circular shape. The result is crispy and light cake, although maybe it's too light to be called cake, served with generous sprinkles of granulated sugar. It is a traditional culinary item, which manages to survive despite the modernization of the world due to its awesomeness. It is said to be originated from Jakarta (Betawi), although it's called different names in different areas in Indonesia, such as bandros in Bandung, West Java, gandos in Central Java, and haluman in Bali. 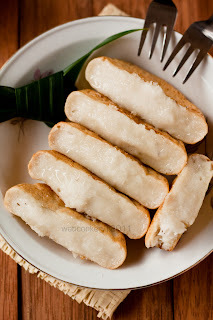 It is also very similar with kue rangi, and I was told that what makes them different is the kind of shredded coconut they use, as well as the serving process. Kue rangi uses melted brown sugar as the finishing, while kue pancong has sprinkles of granulated sugar. It's addictive, the mother said. When eaten fresh from the pan, it is savoury but with sweetness from the slightly melted sugar cutting through beautifully. The crispy skin will also force you to grab another one and stuff yourself with it. Mostly street carts, I guess. It is now harder to find them as they are rather rare, but I spotted them in Jakarta a few times. You will need the special pan to make this popular snack. 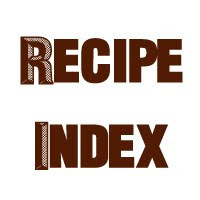 Here's a great recipe taken from Indonesian Food and Recipes. 1. Make coconut milk of half of grated coconut with 200 ml of warm water, flitered. 2. Heat coconut milk over low heat, stirring, stirring constantly until steaming. Input 50 gr flour rice little by little, stirring constantly, until merged / dissolved. Add the pandan leaves and salt. Cook the coconut milk-flour mixture until boiling and thickened. Remove and set aside. 3. Prepare a medium bowl, input remaining rice flour and remaining grated coconut and stir well. Then pour the coconut flour dough (stage 2), stirring constantly until all of them together and smooth. Add 200 ml of water and chicken egg that have been shaken apart. Continue to stir until all ingredients well blended. 4. Prepare pancong shape-cookies. (If you do not have it, this pancong shape-cookies can be bought at the supermarket or at the regular grocery store). Heat the shape-cookies over medium heat while smeared evenly with a little cooking oil so the cake will not stick. 5. Pour 2 tablespoons of dough into each mold until all the boxes filled and closed mold (shape cookies). Bake on medium heat (approximately 10 minutes) until done, usually marked by dry out and get peeled off the cake edge of the mold and the top of cake has full of holes. Remove the cake in a way pried, while still hot sprinkle with granulated sugar to taste. Repeat this step until all the ingredients out. 6. Now, your pancong cake ready to served. It’s better served immediately while warm. Did you know that kue pancong is on the list of showcased street food from Indonesia on World Street Food Festival, Singapore? Mind you though, I have never tried this. The flavour review is obtained via interview with those who have, and they all love this one. I wonder why I haven't had this. On the to-do list for the next back home trip! i love this cake.. it is addictive..
now I'm even more curious about this one. One of my fav cemilan sore. Other than kue rangi which is so much harder to find. Marry me Irene, and make me some kue pancong for breakfast every morning. LOL. LOL a proposal on a post? this is new! haha. I haven't tried this one but I heart rangi with all of my heart. Will definitely try pancong when I'm home! Oh boy...it has been years since I last ate these beautiful babies. I hope it will taste as good ad I remembered it.